What Types of International Jobs are in Education? The global education and training sector is growing moderately, and those with the right set of skills who take initiative in the recruiting process learn that there are many international jobs in education. 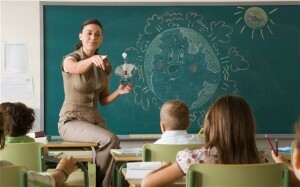 Education is a broad career field that encompasses more than just traditional teachers who specialize in certain subjects, grade levels or unique student needs. The career field also includes school administrators, counselors, librarians and even tutors. Although there is a demand for these education professionals nearly everywhere, certain geographic areas have greater immediate needs than others. Here are some specific international education jobs that are in demand, the usual requirements to obtain education positions abroad as well as the locations that have the greatest demand. The position of teacher is undeniably the most popular of international education careers, and they are needed in all grade categories and subjects. However, the subjects that are in the greatest demand are science, mathematics and English. Education in the sciences, technology, engineering and mathematics drive innovations that ultimately boost economies so talented teachers in these subjects continue to have career opportunities globally. English is the current international language of business, and non-English speaking countries create many programs to help their young people learn standard British or American English. International education jobs are also available for administrators and academic advisors. For example, English-speaking academic advisors can work for international schools to provide guidance to English speaking students participating in university study abroad programs. People can gain entrance into the international education job market through a number of ways, but the requirements for teaching abroad have tightened as more seasoned educators take their skills overseas. Teachers who specialize in certain grade levels and subjects are generally required to have undergraduate degrees in their specialty subjects and associated teaching certifications from their home region. Those who want to teach English as a second language (ESL) can find entry-level positions with an undergraduate degree and a Teaching English to Speakers of Other Languages (TESOL) certificate; these instructors teach at the primary and secondary school levels. Mid-level TESOL positions are also available within foreign governments and universities to those with undergraduate degrees and Certificate in English Language Teaching to Adults credentials. School administrators who want to work in international education should be prepared to verify their administration licenses and several years of experience. The regions that are experiencing the greatest economic growth usually have the most demand for international educators. For example, emerging economies in Asia, South America and parts of Africa heavily request educators who are qualified to teach English as a second language as well as many other subjects. While many parts of mainland China desire British English teachers, other Asian countries prefer American teachers. Hong Kong which already has a large percentage of English speakers within its borders is now heavily recruiting science teachers. To find the best positions in desired locations, educators often join professional organizations like TESOL International Association or contact private international education recruiters. While the international job market may not be the place for fledgling educators to hone their skills, it is an exciting environment for those with experience and a sense of adventure. Teachers who are prepared with the right credentials and verifiable experience land international jobs in education that pay relatively generous salaries, housing allowances and benefits packages that are often considered tax-free income.